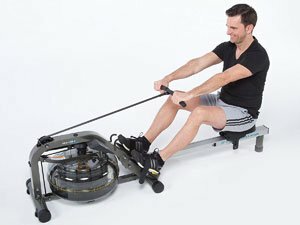 Is The Design Enough With This Air Skandika Elite Pro Rower Machine? Air turbine rowers like the Skandika Elite Pro Rower Machine are appealing for those that want a more professional approach to their workout. This slim, foldable model looks like it could fit in nicely in a gym, but has the comfort features and convenience of an at-home model. There will be many people hoping to get a good workout from this system, as well as helpful data. Is this likely? Can The Skandika Nemo Aqua Rower Liquid Rowing Machine Stand Up To The Popular WaterRower Models? This product is no longer available. You can find similar items here. The key to a good rowing machine is resistance through a realistic movement and process, and this is what the Skandika Nemo Aqua Rower Liquid Rowing Machine aims to provide. Water-based rowing machines are being to catch on with keen users, partly due to the popularity of WaterRower models. Those machines are celebrated for their natural feel, simple approach and great workout. Is The Skandika SF-1150 Regatta Rowing Machine Too Unusual To Be Worthwhile? When looking at the shape and design of the Skandika SF-1150 Regatta Rowing Machine, it becomes immediately clear that there is more to this device than simply providing your basic rowing machine to replicate a machine at the gym. This Skandika rower has a different shape with the curved rail and unusual pulley system on the front, there is no in-your face console on the front for big data displays. There are two adaptable footplates and – most importantly of all – there is the choice between the ordinary handle and separate handles for each hand. Is this design beneficial or just unusual?